The annual Rosenmontag carnival in Germany has dished out its fair share of mockery and satire to almost every significant event over past year, including Donald Trump’s presidency, the rise of populist sentiments and the perceived decline of democracy. Rosenmontag, or Shrove Monday, which is a part of the annual six-day carnival festivities playing out across Germany, has passed peacefully amid enhanced safety measures, according to local media. Carnival organizers traditionally do not hold back when it comes to criticizing world leaders. Donald Trump has undoubtedly turned into this year’s man of the hour judging by the number of carnival floats depicting him in different situations. 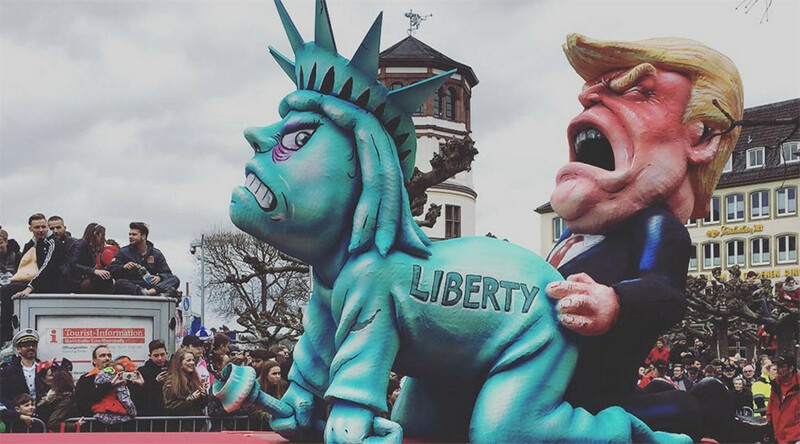 Dusseldorf has seen a most astonishing paper-mache figure depicting the US president grabbing from behind, apparently engaged in a sexual act with the Statue of Liberty on all fours. The creator of this construction must have been inspired by widespread accusations against Trump’s first steps in office, including the notorious travel ban on seven Muslim countries, that are believed to be violating the US constitution and democratic principles. Wiesbaden also presented its own version of the relations between Trump and the Statue of Liberty. In Mainz, Trump was paraded as an elephant with a huge trunk who’s stomping on a china dinnerware set. Dusseldorf showcased Trump in the company of French National Front leader and presidential candidate Marine Le Pen, Holland’s far-right Geert Wilders, leader of the Party of Freedom, and no less than Adolf Hilter. All four are boasting beautiful blonde hair with a caption saying “Blonde is the new brown,” in reference to the Nazis’ symbolic color. Another float showed democracy as a green leaf eaten by pink maggots represented by Russian President Vladimir Putin, Turkish President Recep Erdogan, Hungarian leader Viktor Orban, leader of Polish right-wing Law and Justice party Jaroslaw Kaczynski, and again Donald Trump. #IS #Terror: Unsere nützlichen #Idioten von der #AfD. #Mottowagen #Düsseldorf. Es gab #Applaus. #carnival float #Rosenmontagszug #carnival2017 #Karneval #duesseldorf. Artists also paid some 'respect' to Germany’s Chancellor Angela Merkel portraying her as sad mammoth attacked with a spear by her rival Martin Schulz from the Social Democratic Party in reference to the upcoming elections. In Cologne Merkel turned into enormous lady-bug laying on her back, apparently unable to get back on her legs. Turkish President Erdogan appeared in Dusseldorf as well, dressed in a traditional costume he pointed his finger at a clown, calling him a terrorist. The installation reminds of the diplomatic row that erupted after comedian Jan Boehmermann read an insulting poem about the Turkish leader on his late night TV show. The comedian was prosecuted with Angela Merkel's approval and sparked public criticism. Eventually, Boehmermann was banned from reciting several lines found most offensive by the court. Rosenmontag is celebrated in all German-speaking countries, including Germany, Austria, Switzerland, and Belgium. The holiday is especially popular in the cities of Cologne, Bonn, Dusseldorf, Aachen and Mainz. People tend to dress up in fancy costumes, handing out sweets to children, dancing and participating in parades.